The origins of hypnosis as a practice is hard to place precisely as the mechanism that underlies hypnosis as we best understand it has existed in essence as far back as the earliest recorded practice of Yoga and other Eastern Mystic spiritual and healing devices. Hypnotism essentially relies on the power of the subconscious mind in its response to ‘suggestion’ and for this reason is similar to forms of meditation which involve the repetition of a fixed mantra or the focus upon a positive symbol. It is also similar for the use of a ‘trance state’ in which the subconscious mind is more open to suggestion – this state being the one engendered by meditation when the mind has been fully cleared. Though hypnotic practices vary greatly, with some favouring a more ‘automatic’ or instant hypnosis rather than one involving a slow descent into trance, all practices can find parallels in other practices such as mystic spirituality, organised prayer or other worship, New Age spiritualism, , Yoga, Taoism, Buddhism, Psychoanalysis, Cognitive Behavioural Therapy, and Positive Affirmation, to name but a few examples. Hypnosis historically came into its own as a means of separating out the positive benefit of trance, repetition and suggestion, from its spiritual links, essentially as a move away from what was seen as false and misleading ways of thinking (namely spiritual and religious thought) and towards a more empowering rational form of treatment for patients with a wide range of physical and mental ailments. The first person credited with shaking off the arguably negative spiritual associations associated with the benefits of trance states was ‘Franz Anton Mesmer’ who was himself a student of a Christian spiritual healer who worked in the tradition of ‘magnet’ healing, Father Maximillian Hell. In the late 18th Century Mesmer rejected Hell’s notion that magnetic healing was a gift from God, and in fact attributed the power of healing to the presence of an intrinsic capacity to heal within all ‘creatures’ both human and animal, later conceding that it wasn’t even necessary to use magnets in order to induce a trance, but that one need only the ‘magnetic’ power transmitted from healer to healed. The next major figure in the progression towards ‘hypnotism’ was James Braid who did away with the notion of ‘magnetism’ altogether and attributed the positive effects of ‘mesmerism’ top the physiological states induced by a mental ‘trance’. Debunking the idea that Mesmer’s healing operated by may if the transference of energy from one person to another was the last revolutionary act in breaking ‘hypnosis’ –as Braid termed it – away from its previous religious, spiritual and cultic associations. From here the main figures have been Emile Coue (1857-1926) and Milton Erickson (1901-1980) who both noted the possibility of bringing about hypnotic states and changes in the patient’s attitude merely by the power of suggestion. Erickson has employed a wide range of methods which now are utilised by psychologist’s, counsellors and healers of all descriptions, pioneering the ‘indirect technique’ which recognises the power of inducing trance when the patient is not expecting it, and the importance of everyday language in affecting the sub conscious. The indirect technique is not used to control the patient but simply utilises the way in which everyday diversions in routine can cause a person to go into ‘trance’ state that may only last seconds. Overall the history of hypnosis has been one centred around debunking ‘myths’ and taking the power away from the practitioner whilst giving it to the patient. The overall emphasis has always been on the power of positive suggestion when the mind is most susceptible to it, but the change in emphasis is away from mysticism and towards a simple understanding of the mechanism by which the brain stores and acts upon information. However, it is noted that Yogic practices ad meditation, in their use of the trance state can be as valuable as hypnosis and their is not reason to be wary of these disciplines so long as truly outlandish spiritual claims are not made to the detriment of a persons wellbeing. Hypnosis has become as much a part of debunking certain outmoded and unusual hypnosis practices as those associated with the spiritual. 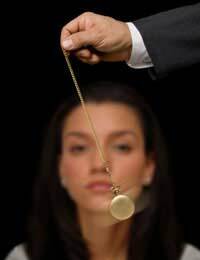 A contemporary hypnotist is less likely to swing a watch to and fro in front of you, putting you into a deep state of trance whilst suggesting to you courses of action that you will automatically act upon later, and more likely to talk to you naturally using techniques of encouragement and suggestion.